← Deksi Systems – We give you actual software technologies!!! The Proton Saga was launched in September 1985 by Malaysia’s Prime Minister on that time, Dato’ Seri Dr Mahathir bin Mohamad ( Now Tun Dr Mahathir Mohamad).The Proton Saga originally based on the 1983 Mitsubishi Lancer Fiore.The name Saga was chosen from the winner of the contest which was held to choose the name of the first national car, Ismail Jaafar is a retired military soldier.The Proton Saga then sold in the United Kingdom in 1989. 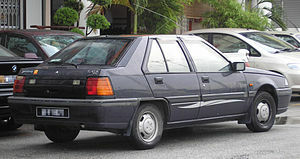 As a symbol of the beginning of the Malaysian automotive industry the first Proton Saga that rolled off the production line was presented to the Malaysian National Museum as a symbol of the beginning of the Malaysian automotive industry.It was offered as a 4-door saloon, followed by the addition of a hatchback variant, introduced in 1988 as the Proton Knight and was later known as Saga Aeroback. Early Proton Saga models were powered by SOHC 8-valve 4-cylinder petrol engines sourced from Mitsubishi, available in both 1.3- and 1.5-litre displacements.Both engines were available with a 5-speed manual transmission, but a 3-speed Mitsubishi Tri-matic automatic was available with the 1.5-liter engine in 1987. In 1990, the line-up was revised with the introduction of 12-valve Megavalve engines, which increased power ratings to 75 bhp (56 kW) (from the original 70.5 bhp (53 kW) in the former 8-valve (Magma) version) for the 1.3-litre engine, and 90 bhp (67 kW) for the 1.5-litre engine. Proton Saga is a symbol of the beginning of the Malaysian Automotive industry. As a Malaysian, we should be proud with our country because we have the capability to make our own car and become one of the automotive country. Proton has manufacture many model after Saga. The latest is Proton Exora. Proton continues on changing its model and becoming more good-looking. Developing into a high-tech luxury Malaysian car. Most Malaysian residents in this days almost can’t afford to buy this car, because its prize are also getting more expensive than ever before. My story is not about to promote the proton automotive industry or to its car products. What I am trying to share with is my old proton saga. In which is until to-day I am still owned this car. My car was the first model of saga. It was already own by first and the second owner before I have owned it. I bought this car from the second owner worth around RM10,000. The brand of this car on its first launch was RM27.00. The first owner bought this car on year 1986. The second owner bought this car fives years later. He own this car until 2006. And from that time on to this day I still have this car. I should say that this car is unique not with its appearance, but because, its whole body and the engine is still the original one. This car has never been over hauled nor has change its engine. If there is any trouble of the car it’s just its battery and the wiring. The battery of course should be change when it is already exhausted. But the wiring is still the old original wire. Yet the wire almost ruined, and is full of patches connected with some wire. But the wiring is still on its original position. Why it is being the unique to me? Because this car had never been got into big trouble or malfunctioned. The engine is still in good condition. This car was swamped into the sea water when I was trying to cross the sea from Semporna to Pulau Bum-Bum for repainting. 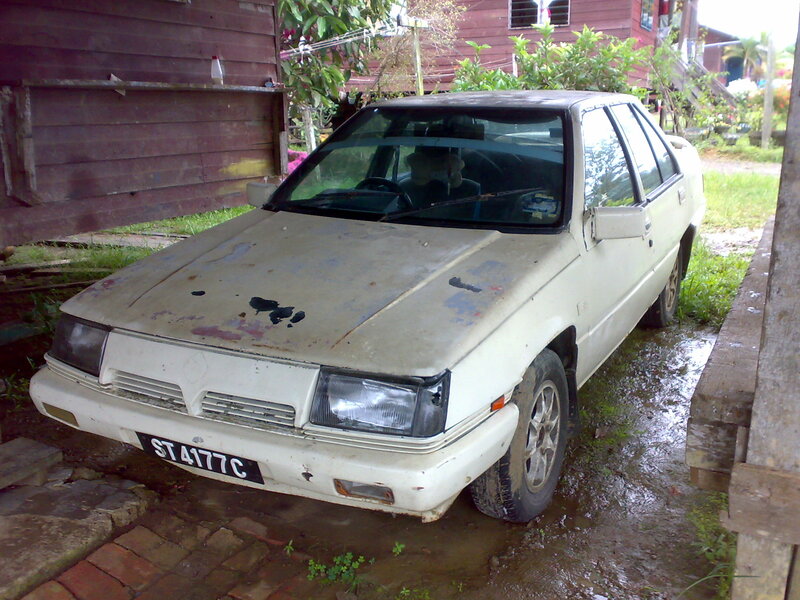 I want to repaint and repair some minor damages on this car in my house in Pulau Bum-Bum. To make it easy for me to do work even night-time. The car swamped into the sea after we finished the repainting and crossing it back to town. I have dismantle it again and rinsed it with fresh water. Fear that might be rusty because of the sea water. Even it has drawn into the sea water my car is still running smoothly until today. That’s why I called it my loving car because it did not give a big trouble in maintaining it, just a little maintenance of engine oil. 3 or 4 times a year. I didn’t do any costly maintenance with this car although it is already almost 25 years old. Would you believed that a car in such a long period of time is still, its body and the engine is the original one. It’s only my Car My lovely Proton Saga old car.